A Washington-based sailor who made a run in late July at the Guinness world record for pullups held by a Navy SEAL ended up in the hospital, but says he plans to make another attempt once he recovers. Air Traffic Controller 2nd Class (AW) Mike McCastle made it to 3,202 pullups on July 26, just 828 shy of the record, before health concerns forced him to head to the emergency room. He lasted 19 1/2 of the allotted 24 hours, but still raised almost $10,000 for the Wounded Warrior Project. As of July 31, he said, he had collected $9,600, with donations continuing to trickle in. McCastle, a distance runner and a command fitness leader assigned to Naval Air Station Whidbey Island, Washington, trained for two months in preparation for the challenge. In order to take Guinness honors, he’d have to complete 4,031 pullups in 24 hours, beating the record set last year by Chief Special Operator (SEAL) David Goggins. McCastle planned to do 4 1/2 pullups per minute for the first six hours of the event, then reevaluate once he hit the 1,500 to 2,000 range. 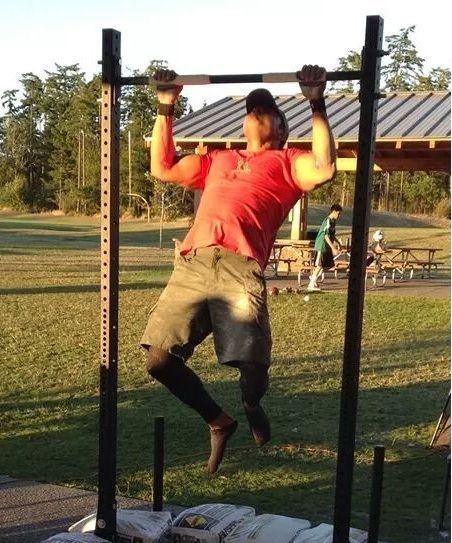 He set up a pullup bar under a picnic shelter at Fort Nugent Park in nearby Oak Harbor with a permit from the city, inviting locals to come out and watch him in action. Unfortunately, the day of the challenge, the video camera had some technical difficulties about an hour and a half in. Guinness requires that the event be filmed from start to finish, including breaks, so he had to come to a complete stop and wait for someone to run out and get a new memory card for the camera. Losing momentum is a serious problem in an endurance challenge, McCastle said. He made it to about 2,100 pullups by 1:30 pm (he had started at 6 am), but he was already showing physical signs of the toll it was taking on his body. He took a break to reevaluate, including a trip to the restroom in which he noticed blood in his urine. He pushed on though, completing 1,000 more pullups before his next break. After a 40-minute rest, he realized he couldn’t close his hands around the bar anymore. After a few more reps, he had to call it quits, at 1:30 am. He went to the emergency room to get his arm muscles checked out, but when he got there, doctors diagnosed him with rhabdomyolysis. Rhabdo occurs when muscles begin to break down from overexertion, releasing fibers into the bloodstream. Once they hit the kidneys, they can cause severe damage and even organ failure. McCastle spent four days in the hospital recovering. He returned to light/limited duty at Whidbey Island on August 1, he said. Despite the medical scare, though, he said he has every intention of trying again, but not as a public fundraiser next time. I hope you get well soon. thanks for your service. Way to go Sailor, Bravo Zulu!!! AC as well back in the 80’s. Well Done! The record is actually now held by a math teacher from jersey named Kyle Gurkovich. He raised money for Sloan-Kettering cancer research. #4 NavyGuy… do you actually know anybody that actually went to Captain’s Mast for being sunburned? That’s been passed around for years. Getting out there and giving life 100%, really helps ensure people get the most out of life and live it to the full. This site makes one think about all that life can offer each of us. I enjoyed the read. This is GAY. Seriously? A pull-ups record on command time? How about doing your J-O-B. #4: You sound like a Blue Falcon. #5: There is nothing wrong with raising money for wounded warriors on command time, assuming he gained the proper approvals. You’re a tool and I’m glad I don’t work for you. Good work AW2! Look forward to seeing your name as the world record holder next time!